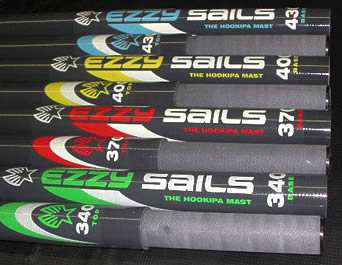 Hands down the best skinny mast on the market The Ezzy skinny masts contain 90% pre-preg carbon fiber. Using Pre-preg carbon is the key to reaching a superior weight-to-strength ratio. The small diameter makes the Ezzy Skinny a dream to sail. You'll notice the improved handling right away in your jibes. Ezzy Boom Shim comes with every Mast. Each mast comes with a mast shim that fits a standard boom. Ezzy has developed a system where tops and bottoms are interchangeable and sold individually. You can buy the perfect combination for your sail quiver. That means fewer masts which in turn means less money out of your pocket. The general rule when mixing tops and bottoms to go with a shorter bottom and longer top. The Ezzy Sails work well on standard diameter masts, but if you are looking for the perfect blend of performance and durability for Wave, Bump and Jump or even Slalom conditions, the Ezzy RDM mast system is is the way to go. The Ezzy RDM's work FANTASTIC on the Ezzy Lion and Ezzy Cheetah sails as well. The Ezzy RDM masts work with any skinny base extension. David Ezzy comments, "It is a life altering experience the first time you use an Ezzy Skinny Mast! You have got to try one out!" We recommend using the 1st choice Ezzy Masts top and bottom with all 2014 and 2013 Ezzy Elite wave sails whenever possible for uncompromised performance. "It is a life altering experience the first time you use an Ezzy Skinny Mast! You have got to try one out!"